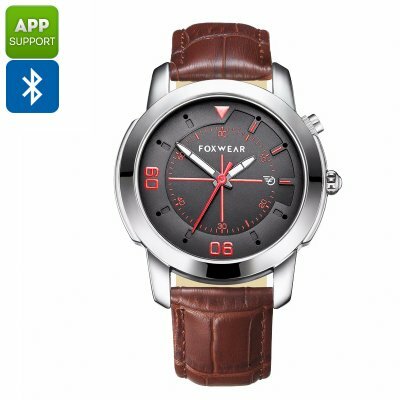 Successfully Added Foxware Y22 Sports Watch - Swiss Ronda 751, Bluetooth 4.0, Pedometer, Calories Burned, Sleep Monitoring to your Shopping Cart. The Foxware Y22 Sports Watch is a delightful timepiece that is a fusion of new and old. The classical circular dial is a not to traditional watches while the modernistic curves and bezel bring a refreshing fusion of new and old. This smart watch has 8 LEDs embedded into the face and the red on black really pops. For precision timekeeping, the watch uses the reliable Swiss Rhonda 751 movement which never falters. The intelligent smart watch has a number of sensors and uses Bluetooth to pair with your iOS or Android Smartphone. Not only will this let you know of incoming message or notifications built they can also record a host of information, keeping track of your movement and calories burned with the pedometer function as well as tracking the quality and duration of your sleep patterns. All the health and movement tracking will be updated to your phone when synced and you can see every reading with the "DayDay Band" app on your smartphone. With an 85mAh battery this sports watch will be able to track your movements for up to 15 days, and even if the battery runs down it will still keep on ticking and bringing you the time as the Quartz movement has its own CR2032 button battery power supply that should last around 2 years. The Y22 sports watch from Foxware comes with 12 months warranty, brought to you by the leader in electronic devices as well as wholesale smart sports watches and fitness trackers..